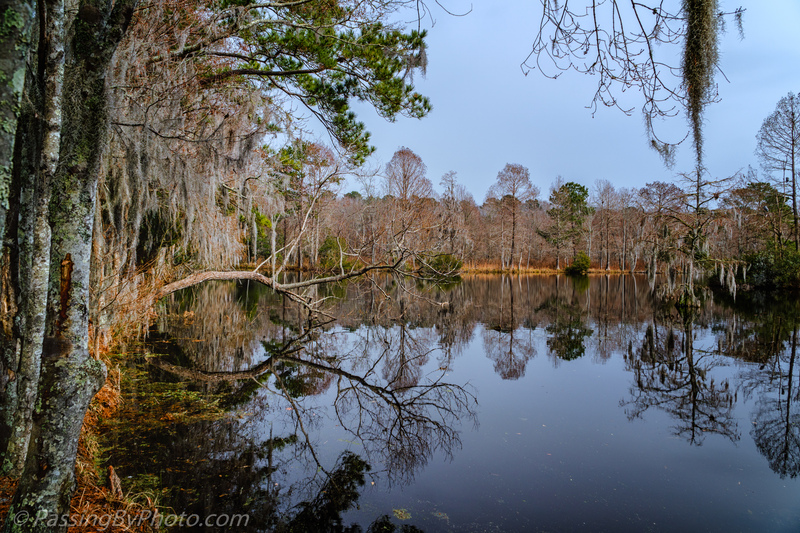 I just returned from five days in Florida with five photographer friends. 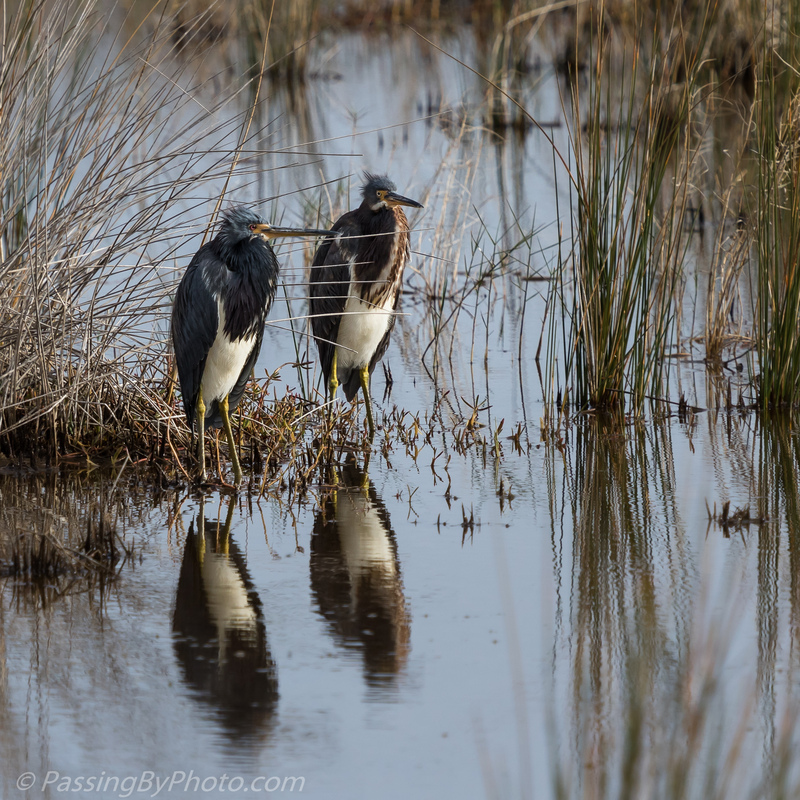 We spent time at Merritt Island National Wildlife Refuge, Viera Wetlands, St. Augustine Alligator Farm and few small spots in between. 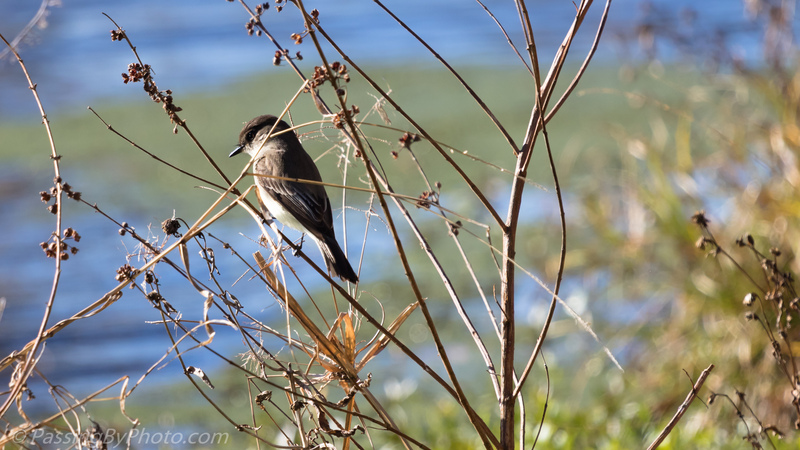 We saw a wide variety of birds, many of which we also see in South Carolina. The ones that we were familiar with looked slightly different in some way. 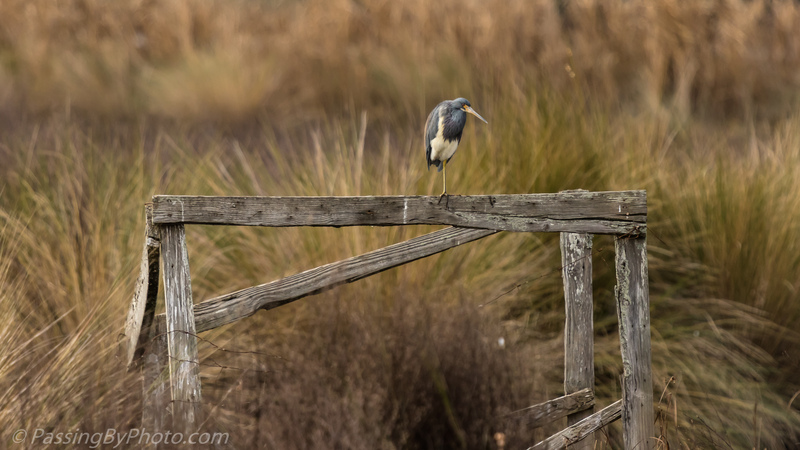 This may be due to differences in breeding plumage or diet. 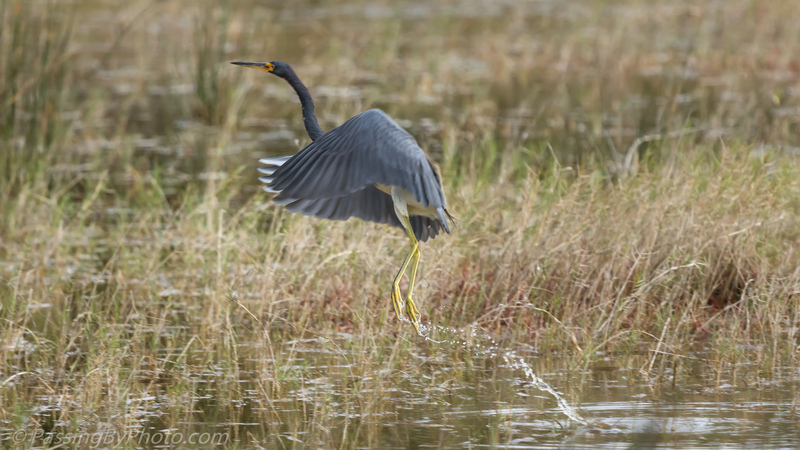 One of the first birds we encountered was the Tricolored Heron. 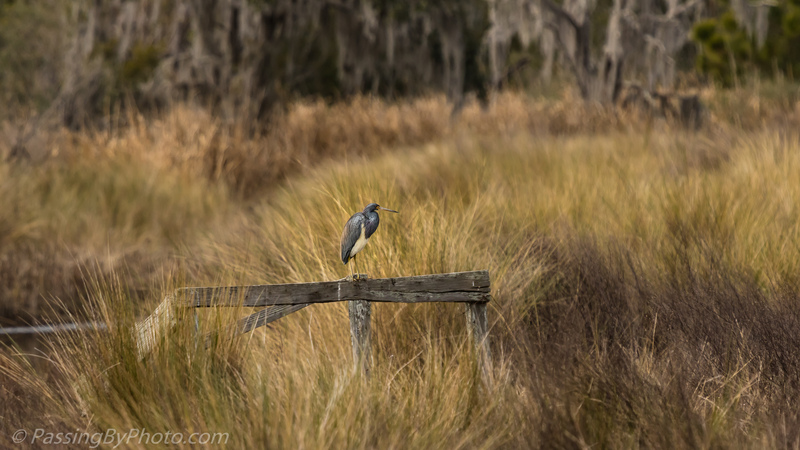 Numbers of these herons were patrolling the swamp areas around Merritt’s Black Point Wildlife Drive, a 7-mile dike road around several shallow marsh impoundments and through pine flatwoods. 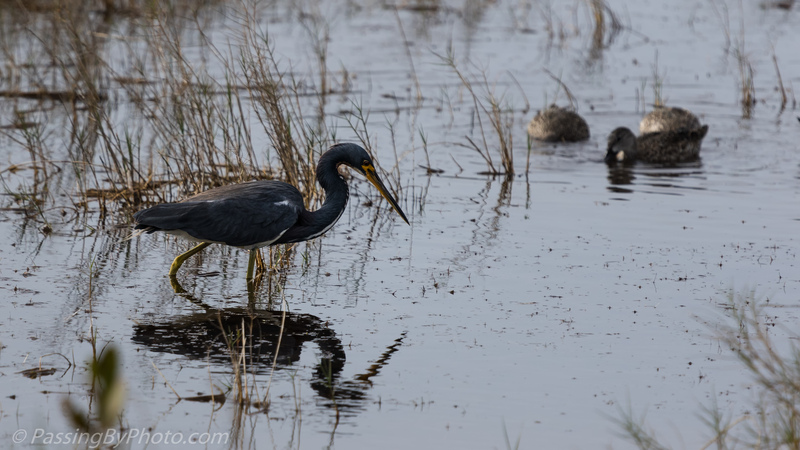 The slate-grey coloration of these Tricolored Herons was much deeper and there seemed to be less iridescence than the SC varieties. 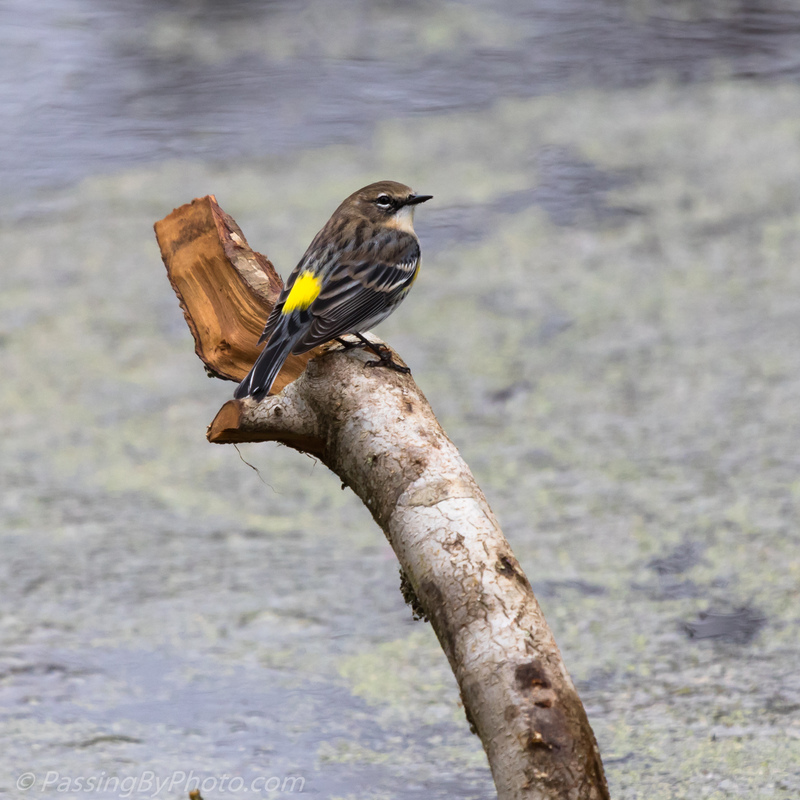 This Yellow-rumped Warbler was showing off how he got his name while enjoying the sun for a few moments. 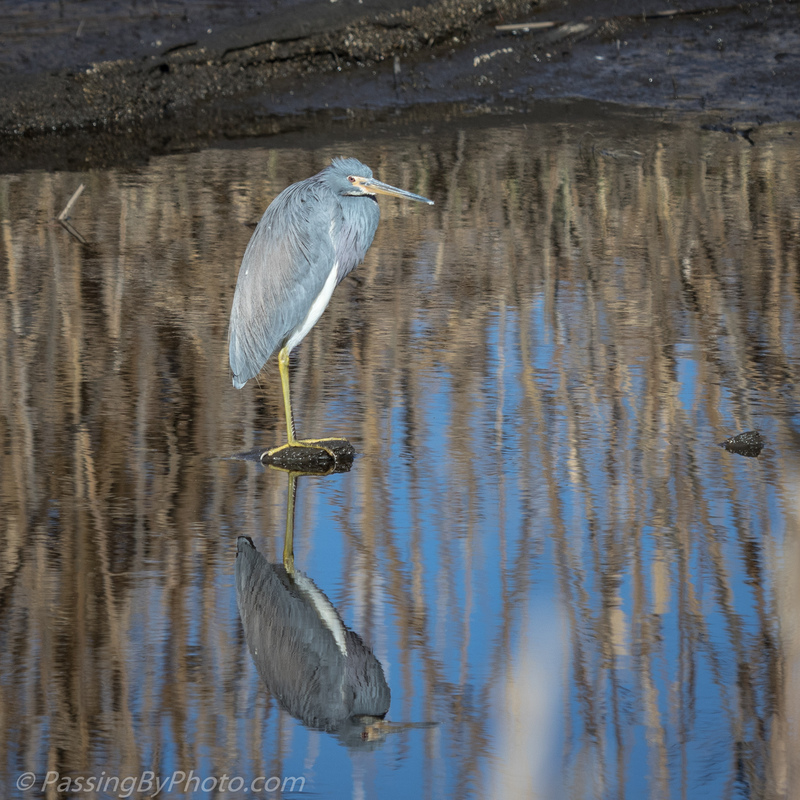 Another reflective afternoon at the pond when there was little heron or egret activity until much later when the sun was almost down and the light poor. 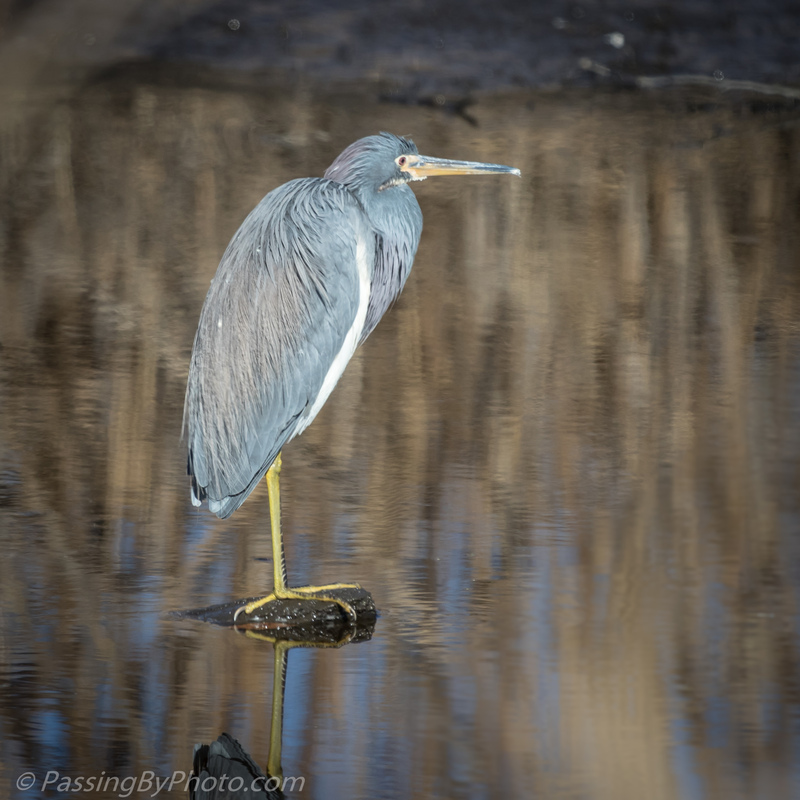 I rarely see a Tricolored Heron standing in the classic heron pose; they always seem to be busy poking around the shoreline. Grass along my edge of the bank restricted my view while the grass on the other bank made a nice addition to the reflection. 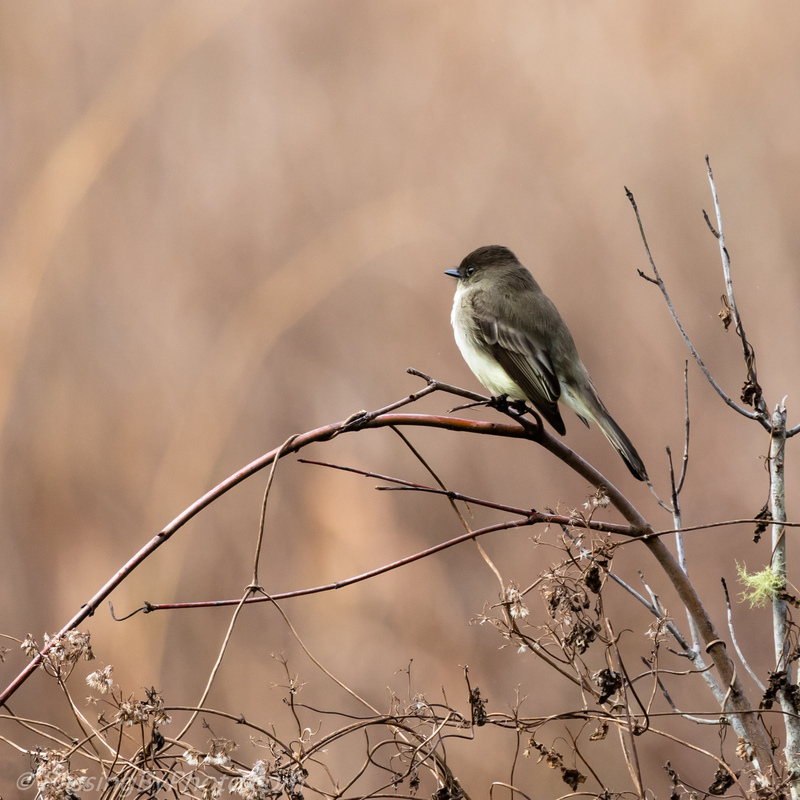 Two Phoebes were each taking a pause between swoops of fly-catching over the water, one in a blue scene and one in a brown scene. The blue of the water with the floating duck weed could make you think spring was imminent. Just a few hundred feet away, the prominence of dull brown in the background clearly says winter is still here. 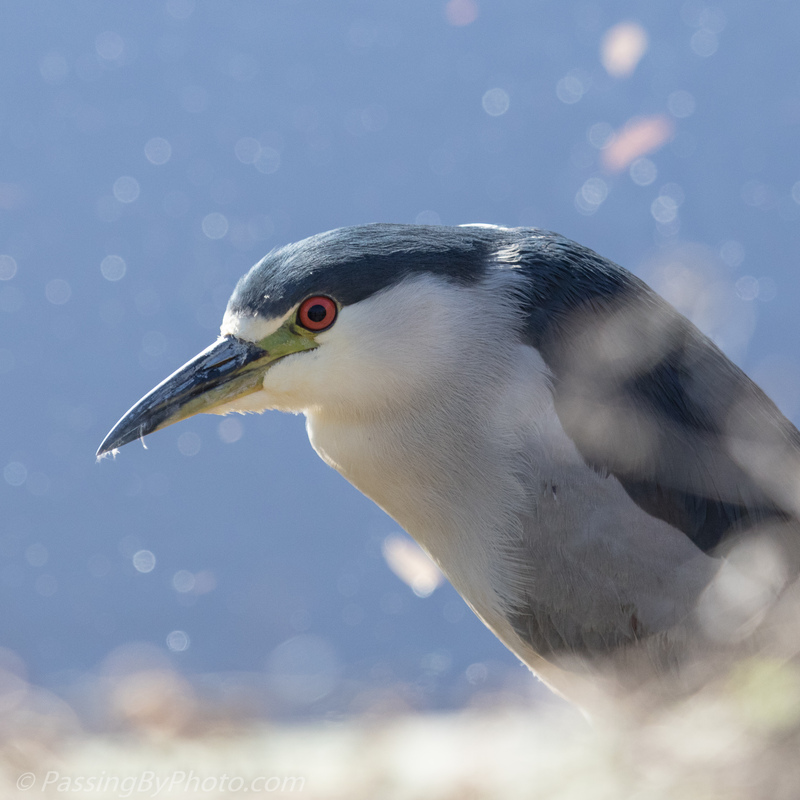 Black-crowned Night-Herons are nesting in the grasses on one of the high spots in an old rice field. I could spot ten or so standing tucked in under the grass, too far for a good photograph. This fellow was all by himself out in the open, perched on the support of one of the “trunks” used to regulate water flow. I was surprised he didn’t fly off as I passed by. I came back this way about an hour later and he hadn’t moved very far, but had turned enough that I could get a good look through the grass on the bank at his colorful eye. A couple more steps and his full body was in view, if not well lit. 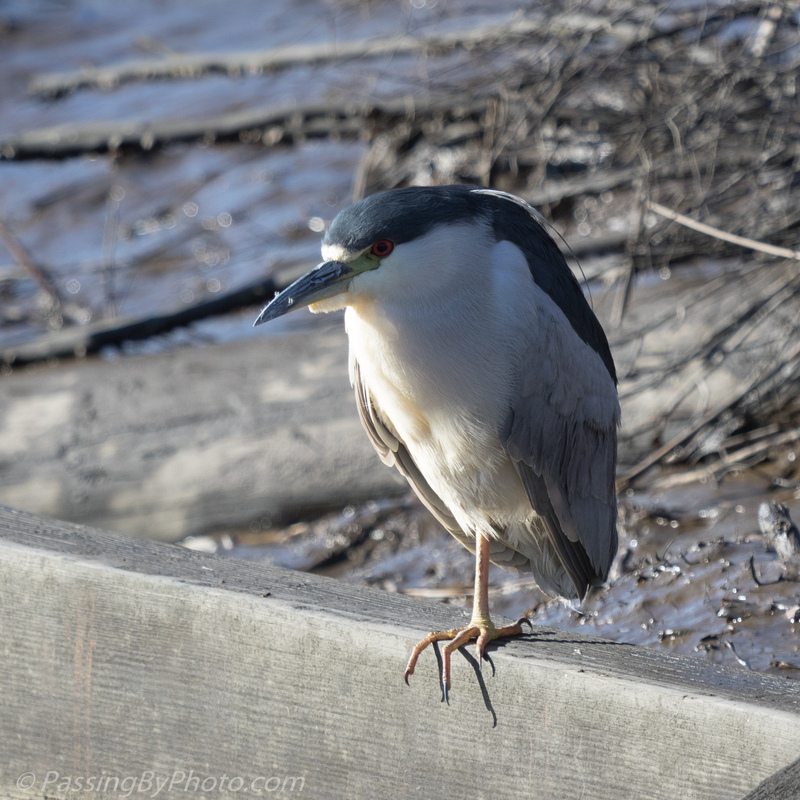 I walked on a little further hoping to get a shot from where I first spotted him, turned around, but he was gone. 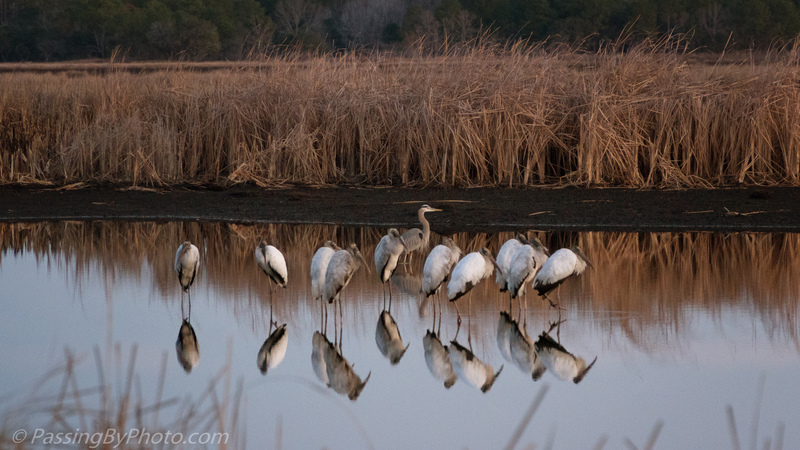 When we arrived at Mary’s Pond about 20 minutes before sunrise on Wednesday this group of Wood Storks with a single Great Blue Heron was huddled in a canal that runs along side the pond. 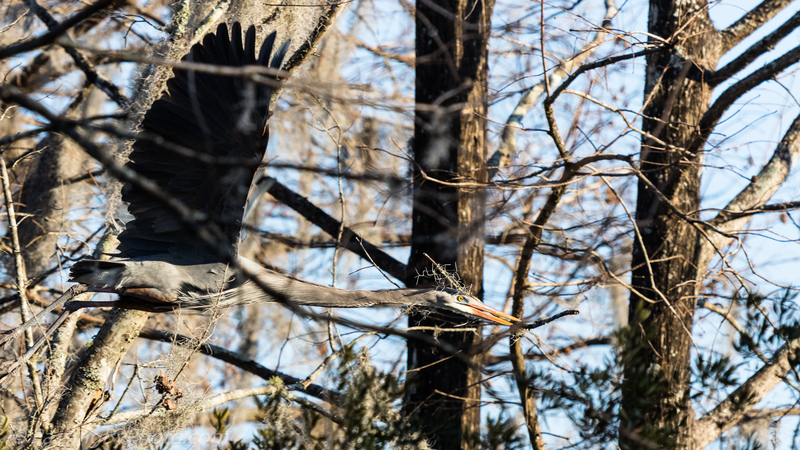 The Heron flew off shortly after I took this photo. As it got lighter the Wood Storks started wading down the canal out of my sight. 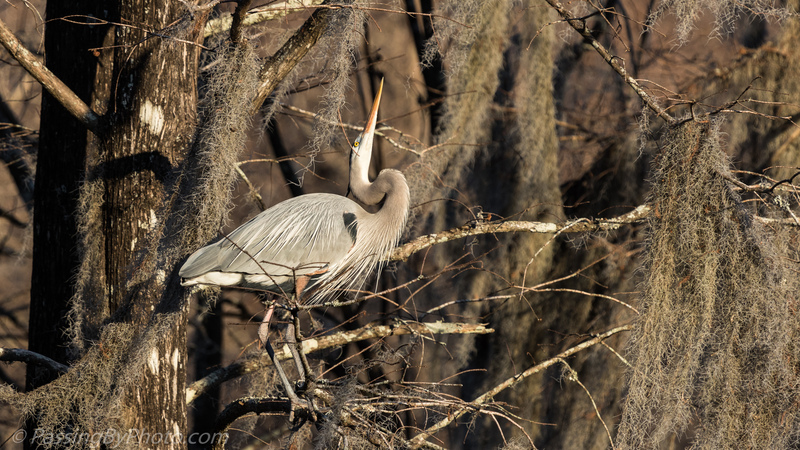 This Great Blue Heron just about tied himself in a knot as part of his afternoon preening. 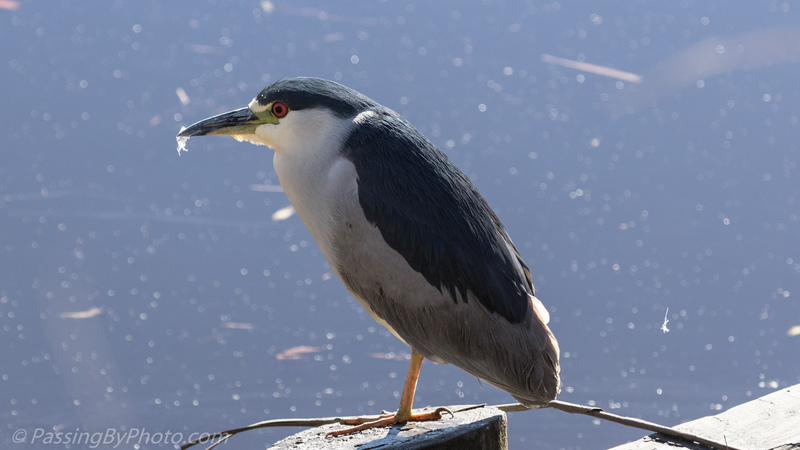 His beak appears much longer, and sharper, than normal from this angle. 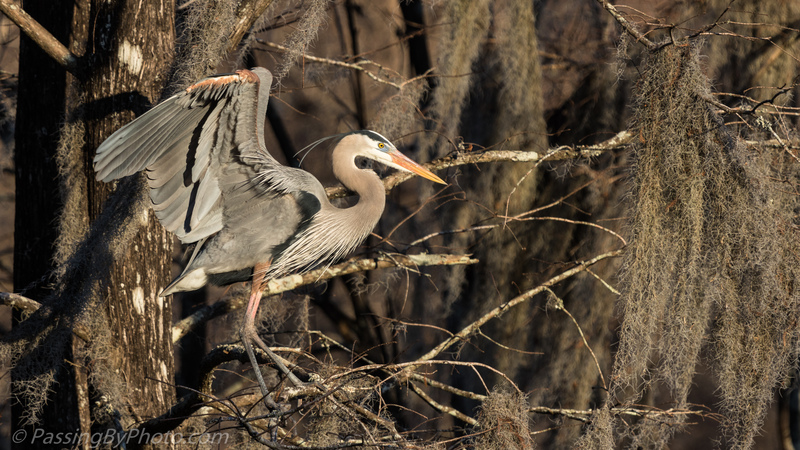 Great Blue Heron – click on image for larger view. 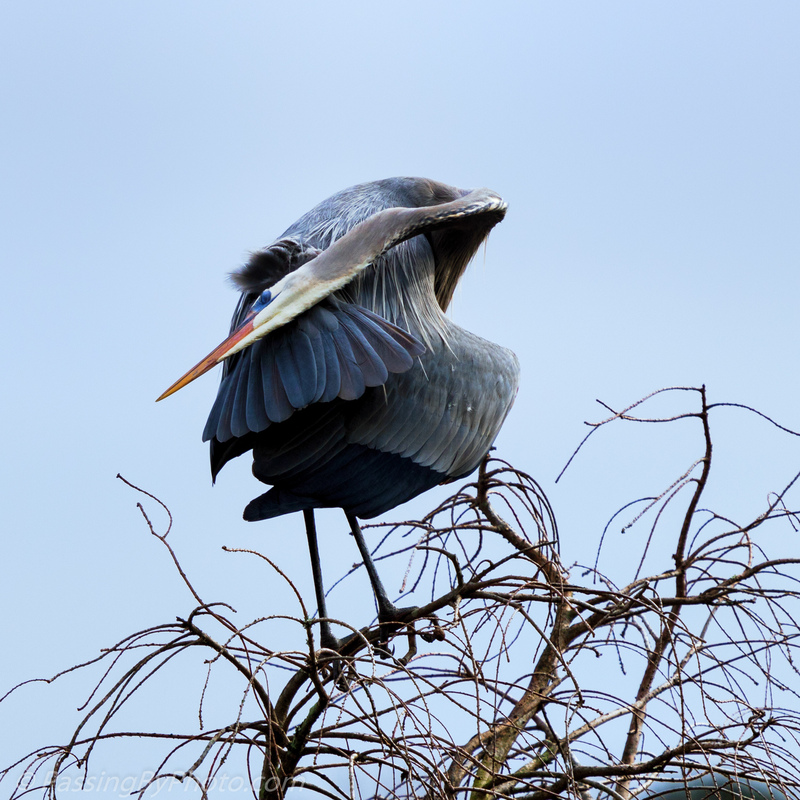 Great Blue Herons put a lot of work into making a good nest. Once a pair is established the male becomes responsible for bringing the sticks. Obtaining them can be quite an ordeal. 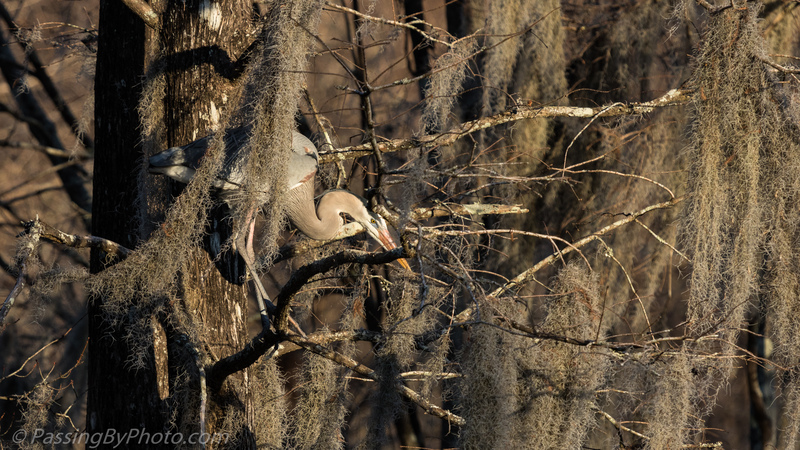 This GBH decided to make a selection from a tree. Of course now the female has to accept and place the stick. More than once I’ve seen an inferior stick get tossed into the water.